Another ship has fallen pray of hijackers off Somalia’s semi-autonomous Puntland region. It has been reported that the pirates have taken over a small Somali boat aiming to use it as a base to attack larger ships. This is the second attack in March since the hijacking of Aris 13 vessel earlier in the same region. The UKMTO confirmed the attack, however, the name of the ship has not been disclosed yet. According to Abdirahman Mohamud, head of maritime police forces in the semi-autonomous Puntland region, the pirates dropped its ten Yemeni crew and a Somali guard on shore and disappeared with the boat together with the food, cook, captain and engineer, Reuters reports. Furthermore, residents of the northern Somali city of Eyl confirmed that pirates from their village had gone to seek potential targets. On March 13, pirates hijacked Aris13 in the same region. 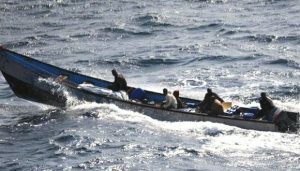 Illegal fishing in the region has been as the foremost reasons for this sudden comeback of piracy in the Horn of Africa.